Preheat the oven to 210 degree celcius. Lightly grease 12 hole muffin tin. Sift the plain flour and baking powder into a large mixing bowl. Stir in the brown sugar and make a well in the centre of the dry ingredients. In a separate mixing bowl, add the melted butter, eggs and milk and stir to combine. Add all at once to the flour mixture and fold until just combined. (Do not overmix ). Fold in the blueberries. Spoon the batter into the prepared muffin tin. Bake for 20 minutes or until golden brown. Turn out onto a wire rack to cool. 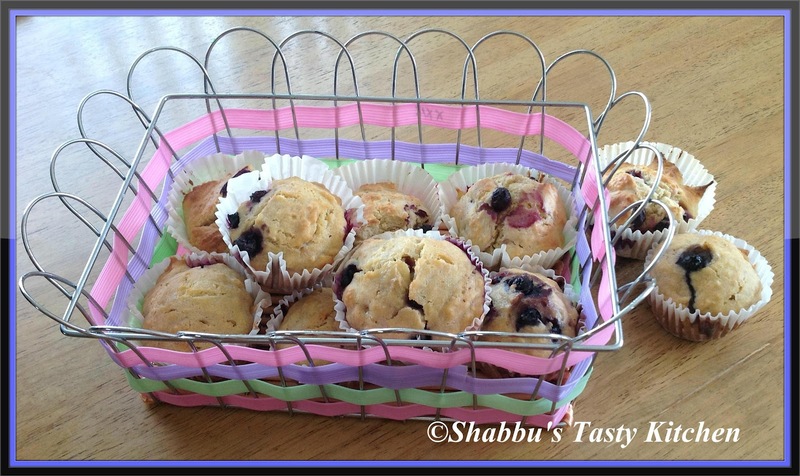 Wish to grab and some muffins rite now,beautiful and prefect looking muffins. this is looking so fantastic. I love those muffins on which some blueberries' juice is coming out. love those. These look delicious! I love blueberries, but I don't buy them all that often. I think they're really expensive right now. But I forgot I could buy them frozen! Yum! These blueberry muffins are perfectly done ad looks so moist..first time here and happy to follow u ..
One of my fav..feel like grabbing some..